Hi! Remember me? I’m the one that made baked donuts and posted a bunch of Passover stuff then sort of disappeared (except for on Twitter, you can always find me there!). Things have been kind of crazy over here. My back got really bad again (MRI and nerve test next week, eeks! ), then my beloved KitchenAid mixer starting wobbling and almost walked off my counter, and then I got laid off from my job of 3+ years. On the flip side, now that I’m home during the day, I was able to spend three hours on Google finding potential solutions to the wobbly mixer. Fingers crossed that it is finally fixed! A couple days after I was laid off, I went down to San Diego to celebrate my mom’s birthday with the family. Around that time, my mom apparently asked my dad to pick up lemons while he was at Costco. And pick up lemons, he did. A HUGE bag of lemons, more than my mom would ever use before they would go bad. 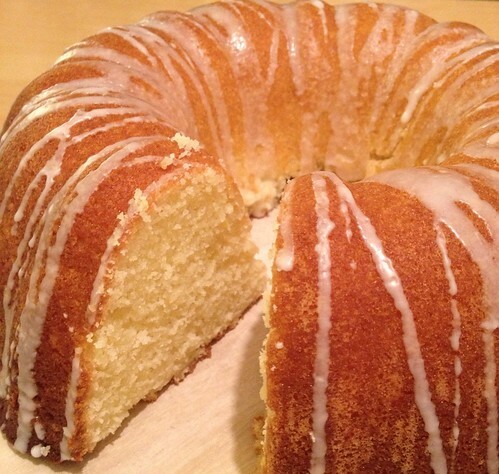 Fortunately, my sister and I benefited from my dad’s shopping mishap, and I decided a lemon cake was in order. With my mixer not wobbling off the counter, I got to work zesting, juicing, and mixing, and had high hopes. Sadly, those hopes were squashed. I’m sure this is a perfectly decent lemon cake, even if the texture and taste of the bottom and sides was a little cornbread-ish. But once you have tasted Ina’s Lemon Cake, any other lemon cake is guaranteed to fail in comparison. Now if you’ll excuse me, I have Judge Judy to watch before I head to happy hour at 5:00. Lemon anything brightens up a day!